The Harerge Oromo are the descendants of the Barentu confederacy that moved toward the east of the Ganale River during the Oromo migration of the 16th century. They consist of the Ittu, Ania, Ala, Nole, Jarso and Babile tribes. They were able to occupy the land of the Harar uplands where they came in contact with the Somali and the Harar city-state. They became sedentary agriculturalists. Some of their tribes like the Nole and the Babile live mixed together with the Somali. The Harerge Oromo are friendly and hospitable people. They are farmers and they also have livestock. 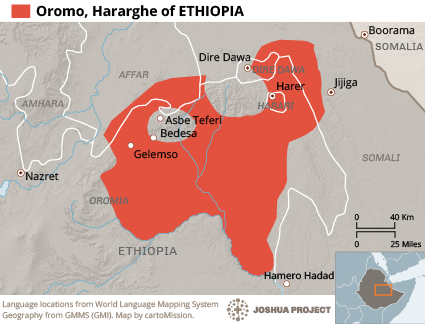 Not much has been done to evangelize the Harerge Oromo. The Harerge Oromo, although not all, became converted to Islam through the influence of the Harar city-state which also became instrumental in spreading Islam to all other southern parts of Ethiopia. The Ittu have remained largely followers of ethnic religion. The few believers that are from among the people have left their community to join the Christian communities from other people groups. 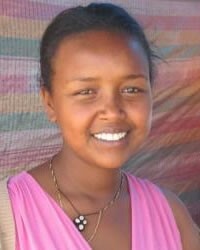 * Ask the Lord to send laborers who have the burden for the Harerge Oromo. * Pray that the Lord raise a Harerge Oromo church. * Pray that the Lord would open the hearts of the Harerge Oromo.View Oromo, Hararghe in all countries.